Blondie and Brownie: Andrea Bocelli VIP Ticket Giveaway! Barilla's Summer of Italy is quickly coming to an end, but there's still a week's worth of activities slated. And if you've been seeing all the activities that I've been going to as Brand Ambassador, you know next week's will be worth it. Next Tuesday, Casa Barilla will be up and running in Rumsey Playfield, but that's not all! Thursday night, Andrea Bocelli will be singing live in Central Park and two of you lucky readers will get to go with a guest! This concert is big in a few ways. One, it's Andrea Bocelli. 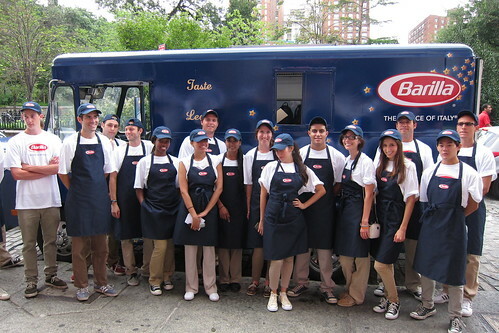 Two, for the first time ever in Central Park, Barilla will be the exclusive food provider during the concert. And three, 25% of the proceeds from the meals purchased during the concert will benefit the Food Bank for NYC. Now, Barilla has bestowed upon me four vouchers for VIP tickets, each good for one ticket. Since no one likes going to concerts alone, I'm going to give two vouchers to two lucky winners. In order to get your tickets, you will need to stop by Casa Barilla to redeem the VIP tickets. By the way, VIP means a separate seating area and food options from the general public! HOW TO ENTER: Email me at blondieandbrownie at gmail.com by Tuesday, September 13th at 9am. I will then use the powers that be on Random.org to pick two winners. Full disclosure: Contest prize is provided by Barilla. I am a sponsored and compensated Brand Ambassador for their Summer of Italy initiative.